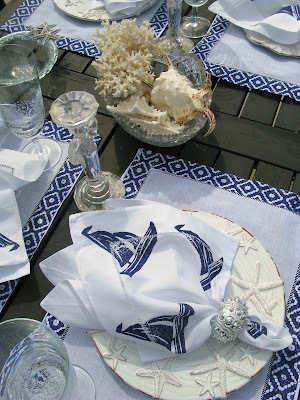 I am soooo excited about our new collection of table linens and pillows from Low Country Linens, that I just have to share. There's just something so special about putting together a brunch, lunch or dinner party beside the sea! I love those times with my family (and with Tom!) when we can linger around a lovely table, enjoy scrumptious food, good wine, but especially each other's stories and company. Look how creative Low Country Linens has been with combining not only coastal motifs, but also modern and zebra designs mixed with the beachy themed napkins and placemats to create something very unique! The possibilities are unlimited; mix in shells, vintage candlesticks, silver accents, your favorite china and glassware. Maybe a model sailboat? Or a beautiful piece of driftwood? Personally, I am a sucker for vintage cocktail glasses, and think that something from my collection would look particularly beautiful! P.S. These are all made in America - love supporting our small business artists! These are really pretty, great find Caron! Especially the yellow on white. I also love linens and collected they for years and love, love vintage. Happy 75th Birthday Golden Gate Bridge!